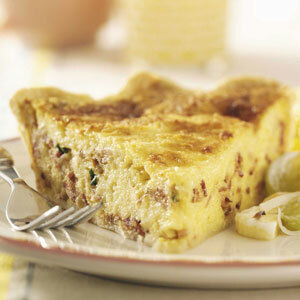 a fun and easy way to make quiche! 8 yummy slices. Lightly grease a 10″ diameter quiche dish. In a large bowl, beat together milk, eggs, baking mix, butter and parmesan cheese. The mixture won’t be smooth, so don’t over beat. Stir in broccoli, ham and Cheddar cheese. Pour into prepared quiche dish. Bake in oven for 50 minutes, until the eggs are set and top layer is golden brown.